What’s the one thing more people bring back from a holiday than anything else? Photographs. In 2017 it’s estimated that almost 1.3 Trillion photographs were taken and that number will increase this year. This hard-to-wrap-your-head-around number is spurred on by the development of digital camera technology, especially camera phones credited with the taking of more than 80% of all photos. If you're keeping track, taking photos on film (remember film?) peaked in 2000 with a mere 85-Billion images taken. Whether a professional , an amateur, or just a holiday snapper, few would argue that Scotland is a photographer’s paradise --- from Caribbean style sandy beaches to snow capped mountains, from shimmering lochs to glacially carved glens, from rural crofting villages to the urban centers of Glasgow and Edinburgh, for the photographer Scotland has a lot on offer. To aid in capturing the very best possible pictures it helps to know where the best locations are, the best time of day or year to be there, and in the event of your visiting Scotland, often how to get there. 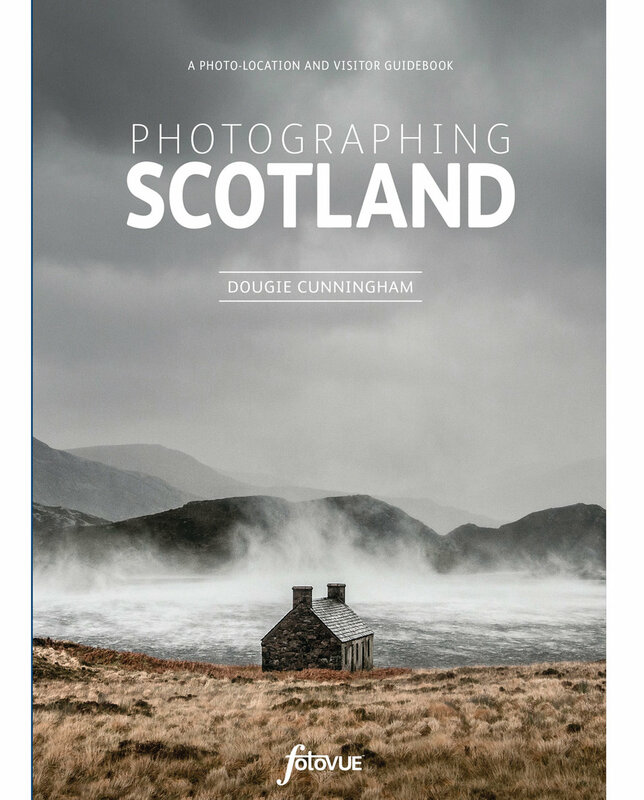 Thankfully help has just arrived in the form of the latest guidebook from fotoVUE, "Photographing Scotland" by award-winning Glasgow photographer Dougie Cunningham. At almost 600 pages covering some 280 locations the book was more than 4 years in the making. For ease of use as a planning tool, the country is divided into five regions, the Lowlands, Eastern Highlands, Western Highlands, Western Isles, and the Far North. The various locations of each region are highlighted on maps and the provided information includes suggestions on what to shoot at each location, directions on how to get to there, ease of accessibility, and suggestions on the best time of year or day to see the location at its very best. Whether you have an interest in photography or not that information alone can be quite valuable in any holiday planning. Also included are general sections about Scotland's climate and unpredictable weather, driving and parking etiquette, wildlife you might encounter – remembering that much of Scotland is still real wilderness, safety equipment for you and your camera gear, emergency contact information, and even a few words about the dreaded midges! A typical spread in the book will feature Dougie's photos from the location but more importantly the book is jammed with helpful information from map and GPS coordinates on where to conveniently park, to how to get to the location, other nearby venues, any accessibility issues and more. The photo captions also give details on the equipment and settings Dougie used to capture his images. Oh, and did I mention photographs? What would a photography guide book be without photographs. Hundred of stunning images are included which, if considered alone, would make an outstanding coffee table book. These photos, and all of the information included herein is the work of award winning Glasgow photographer Douglas, or Dougie, Cunningham. Dougie owns Leading Lines Photography and is especially renowned for his landscape photography. In 2016 he won the Classic View category of the Landscape Photographer of the Year Award. Dougie is also in demand as a wedding photographer, does commercial and corporate events and commissions. His work has sold widely including to corporate clients in cities like London and New York. More than 280 locations are included, many of them iconic Scotland scenes, like Glenfinnan in the spread above. However, Dougie also visited many lesser known locales, sometimes finding views that even surprised him, like on his climb to the summit of Beinn a' Chearcaill - North Highlands, where the view is stunning! Note: This is the author's iPhone photo taken of Dougie's photo from the book. "Photographing Scotland" is the latest in a series of photo guidebooks published by fotoVUE, a leading publisher of such guidebooks for the UK. This is not a pint-sized pocketbook guide but a true, extensively detailed, reference book that visitors and resident photographers of Scotland alike will find invaluable. Even if you don't have a serious interest in Scotland, and perhaps merely want to visit places like Glenfinnan or Arthur's Seat or any number of other iconic Scottish travel sites, the information in these pages should be quite helpful in any Scottish travel planning.